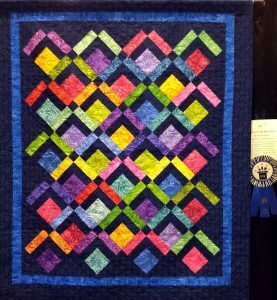 As mentioned in my last post, all three of the quilts that I entered into the West Houston Quilter’s Guild quilt show won ribbons. Here are the other two quilts. The one on the left won a First Place ribbon. I made the quilt from fabric I bought at Missouri Star Quilt Company on my trip there last year, so I named it “Missouri Trip Memories”. The one on the right won a Third Place ribbon. I chose the fabric for this quilt on a trip that my bee took to Massachusetts to visit a bee member who has moved there. 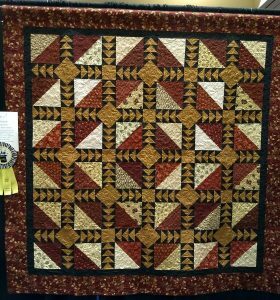 Because we used to go watch the geese every fall on the Katy rice fields and this quilt has a lot of Flying Geese blocks, I named it “Katy Prairie”.